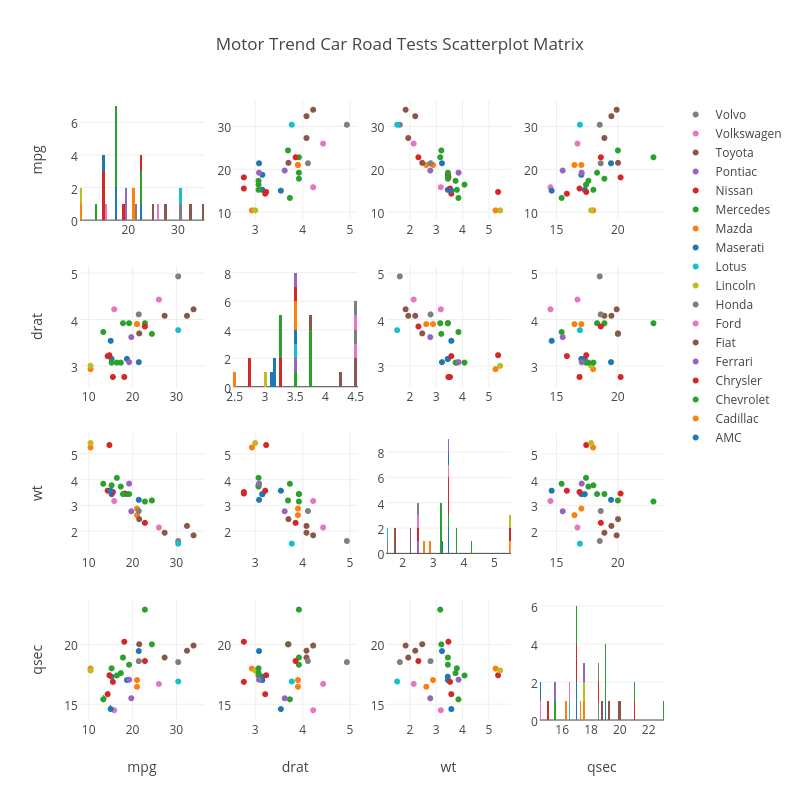 Octogrid's interactive graph and data of "Motor Trend Car Road Tests Scatterplot Matrix" is a histogram, showing AMC, Cadillac, Chevrolet, Chrysler, Ferrari, Fiat, Ford, Honda, Lincoln, Lotus, Maserati, Mazda, Mercedes, Nissan, Pontiac, Toyota, Volkswagen, Volvo, AMC, Cadillac, Chevrolet, Chrysler, Ferrari, Fiat, Ford, Honda, Lincoln, Lotus, Maserati, Mazda, Mercedes, Nissan, Pontiac, Toyota, Volkswagen, Volvo, AMC, Cadillac, Chevrolet, Chrysler, Ferrari, Fiat, Ford, Honda, Lincoln, Lotus, Maserati, Mazda, Mercedes, Nissan, Pontiac, Toyota, Volkswagen, Volvo, AMC, Cadillac, Chevrolet, Chrysler, Ferrari, Fiat, Ford, Honda, Lincoln, Lotus, Maserati, Mazda, Mercedes, Nissan, Pontiac, Toyota, Volkswagen, Volvo, AMC, Cadillac, Chevrolet, Chrysler, Ferrari, Fiat, Ford, Honda, Lincoln, Lotus, Maserati, Mazda, Mercedes, Nissan, Pontiac, Toyota, Volkswagen, Volvo, AMC, Cadillac, Chevrolet, Chrysler, Ferrari, Fiat, Ford, Honda, Lincoln, Lotus, Maserati, Mazda, Mercedes, Nissan, Pontiac, Toyota, Volkswagen, Volvo, AMC, Cadillac, Chevrolet, Chrysler, Ferrari, Fiat, Ford, Honda, Lincoln, Lotus, Maserati, Mazda, Mercedes, Nissan, Pontiac, Toyota, Volkswagen, Volvo, AMC, Cadillac, Chevrolet, Chrysler, Ferrari, Fiat, Ford, Honda, Lincoln, Lotus, Maserati, Mazda, Mercedes, Nissan, Pontiac, Toyota, Volkswagen, Volvo, AMC, Cadillac, Chevrolet, Chrysler, Ferrari, Fiat, Ford, Honda, Lincoln, Lotus, Maserati, Mazda, Mercedes, Nissan, Pontiac, Toyota, Volkswagen, Volvo, AMC, Cadillac, Chevrolet, Chrysler, Ferrari, Fiat, Ford, Honda, Lincoln, Lotus, Maserati, Mazda, Mercedes, Nissan, Pontiac, Toyota, Volkswagen, Volvo, AMC, Cadillac, Chevrolet, Chrysler, Ferrari, Fiat, Ford, Honda, Lincoln, Lotus, Maserati, Mazda, Mercedes, Nissan, Pontiac, Toyota, Volkswagen, Volvo, AMC, Cadillac, Chevrolet, Chrysler, Ferrari, Fiat, Ford, Honda, Lincoln, Lotus, Maserati, Mazda, Mercedes, Nissan, Pontiac, Toyota, Volkswagen, Volvo. The x-axis shows values from 0 to 0. The y-axis shows values from 0 to 0.